Hello. My name is Tracy and I am addicted to horror. As a child, I was incredibly sheltered. I saw my first real horror film, Darkness Falls, at the age of seventeen. My first horror film was about the Tooth Fairy and I was terrified. Don't judge me. After that first taste of totally safe fear, I was hooked. I absolutely fell in love with watching things on a screen that terrified me, but couldn't do any real harm and went away when the movie ended. When I was eighteen I saw my first found footage horror movie and they've been my absolute favorite ever since. Found footage films get so much hate and I truly don't understand why. Please allow me to refute some of the more common arguments I've heard against these movies. » They make some viewers nauseous. I suppose that's a pretty valid excuse not to watch them. If I became nauseous from shaky cam footage, I think I'd take some dramamine and keep on going, but I'm pretty dedicated. » It's hard to get to know the characters. Let's be real here. I'm watching a horror movie to be scared. Personally, I enjoy being in the driver's seat, so to speak. If I wanted amazing character building I'd probably be watching a different genre of film. » No one would be filming something so horrifying. If I'm watching a movie about ghosts or aliens or demons or monsters, I can certainly suspend my disbelief a little further to allow for a character toting around a camera. » Main characters die sometimes and that's sad. If you wanted a happy ending, you should probably go watch a romantic comedy or a fairytale. This is horror. It's supposed to be horrifying. I have a love/hate relationship with found footage. On the one hand, I absolutely adore the rush of not knowing what's around the next corner or what I'll see with the next swing of the camera. On the other hand, it's really embarrassing to jump out of my seat in front of other people every time there's a jump scare. An oldie but a goodie, The Blair Witch Project was the first found footage film I ever saw. It terrified me then and it's still my go-to horror movie when I'm looking for a scare. The Blair Witch Project was marketed in such a way that many people were fooled into believing it was real and I'll admit I was totally convinced too. Definitely check this one out if you've somehow missed it before now! 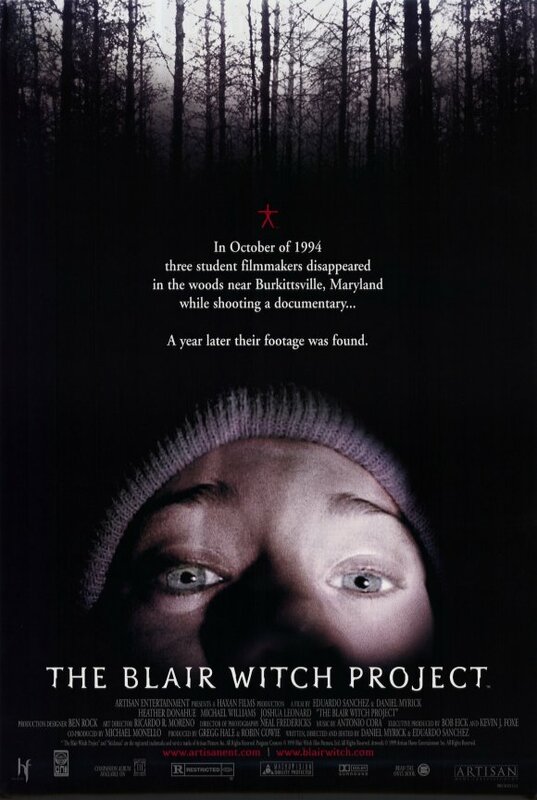 "Presented as a straightforward documentary, the film opens with a title card explaining that in 1994, three students went into the Maryland back woods to do a film project on the Blair Witch incidents. These kids were never seen again, and the film you are about to see is from their recovered equipment, found in the woods a year later. The entire movie documents their adventures leading up to their final minutes." Grave Encounters is a movie that has a way lower rating than I think it deserves. This one combined with Grave Encounters 2 tells such a cool story and really plays to people's worst fears. 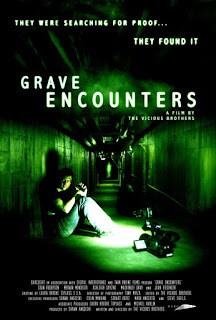 "Lance Preston and the crew of "Grave Encounters", a ghost-hunting reality television show, are shooting an episode inside the abandoned Collingwood Psychiatric Hospital, where unexplained phenomena has been reported for years. All in the name of good television, they voluntarily lock themselves inside the building for the night and begin a paranormal investigation, capturing everything on camera. They quickly realize that the building is more than just haunted - it is alive - and it has no intention of ever letting them leave. They find themselves lost in a labyrinth maze of endless hallways and corridors, terrorized by the ghosts of the former patients." 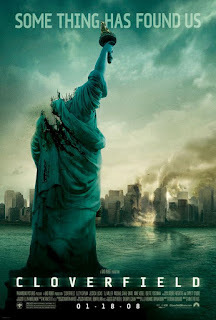 I saw Cloverfield in a dollar theater on a first date and was totally riveted from start to finish. The date didn't go very well, but the movie totally blew my mind! It combines sci-fi with horror and is mysterious enough to keep you on the edge of your seat. Did I mention this is a J.J. Abrams film? A lot of people try to act like they're too cool to like Cloverfield, for some reason. I never understood that, but I own this one and still watch it from time to time. "Producer J.J. Abrams teams with writer Drew Goddard and director Matt Reeves for this frenetic tale of a powerful destructive force that descends upon New York City, and the four desperate people who put their lives on the line to embark on a perilous rescue mission." Did you really think I could make a list of the best found footage horror films and not include Paranormal Activity? While I was well acquainted with found footage at this point, Paranormal Activity scared the crap out of me. It still does, even though I know what to expect. I have seen every movie in this franchise. While I admit none of the sequels have been very good, I'll probably see the next one. I'm holding out hope for another movie as good as the first. "A haunted house makes no secret of the fact it's not pleased with its new tenants in this independent tale of supernatural horror. Katie (Katie Featherson) and Micah (Micah Sloat) are a twentysomething couple who've just moved into a new home in San Diego, CA. Katie has an interest in the paranormal and believes that malevolent spirits have been following her since childhood, though Micah is not so easily convinced..."
Ahhh... A good old fashioned monster lock-in flick. After I saw Quarantine I found out it was a remake of the Spanish film Rec. That one does have a better rating, but you'll have to read the subtitles. I found Quarantine to be pretty amazing even as a remake, so you really can't go wrong either way! "Television reporter Angela Vidal and her cameraman are assigned to spend the night shift with a Los Angeles Fire Station. After a routine 911 call takes them to a small apartment building, they find police officers already on the scene in response to blood curdling screams coming from one of the apartment units. They soon learn that a woman living in the building has been infected by something unknown. After a few of the residents are viciously attacked, they try to escape with the news crew in tow, only to find that the CDC has quarantined the building." This one is actually very recent. I saw this in theaters last year and was really blown away by it! This is a horror film that actually requires you to use your brain a little. The plot isn't handed to you on a platter. You'll definitely have to put the pieces together as you watch. 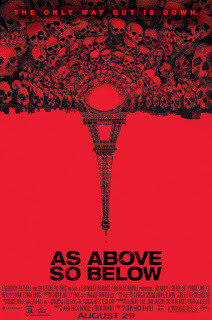 As Above So Below weaves together horror with the tale of the Philosopher's Stone to create a really unique movie experience. "Miles of twisting catacombs lie beneath the streets of Paris, the eternal home to countless souls. When a team of explorers ventures into the uncharted maze of bones, they uncover the secret of what this city of the dead was meant to contain. A journey into madness and terror, As Above, So Below reaches deep into the human psyche to reveal the personal demons that come back to haunt us all." I have always been fascinated by the story of Chernobyl, so this movie was an obvious MUST WATCH when it first came out. Despite mixed reviews, I totally love it and have seen it more than a few times. 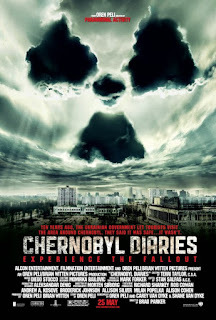 Chernobyl Diaries is basically a monster movie and the found footage format makes it all the more terrifying! "The film follows a group of six young vacationers who, looking to go off the beaten path, hire an "extreme" tour guide. Ignoring warnings, he takes them into the city of Pripyat, the former home to the workers of the Chernobyl nuclear reactor, but a deserted town since the disaster more than 25 years ago. After a brief exploration of the abandoned city, however, the group soon finds themselves stranded, only to discover that they are not alone..."
There you have it, my favorite found footage horror films. Are any of these on your top list? Which ones would you add?